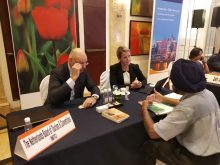 The Holland Sales Mission kicked off on August 28 in New Delhi amidst a packed gathering at Shangri-La Hotel. The Netherlands Board of Tourism & Conventions (NBTC), in collaboration with Amsterdam Airport Schiphol, KLM Royal Dutch Airlines and Jet Airways, is organising the three-day, three-city roadshow from August 28-30 in Delhi, Bengaluru and Mumbai. “For 2018, this is our key activity in the market. This year, we expect a growth of over 25 per cent from the Indian market. We are mainly focusing on leisure tourists, and MiCE is more on a reactive basis. In terms of marketing, we have a 360-degree approach, so we focus on the travel trade, consumers, as well as press and PR. These are the three key elements for promotions,” said Carola Muller, Global Travel Trade Manager, NBTC, when speaking about the agenda this year. The Indian market continues to be one of the most important contributors of international visitors into the Netherlands. The country recorded a growth of 31 per cent in visitor arrivals from India in 2017, attaining a remarkable surge over the previous year. NBTC has confirmed recording 67,000 visitors from India until May 2018, and this year’s Sales Mission aims to achieve good numbers.